John Bryson was found unconscious on a disused railway line back in early February. He is pictured wearing the jacket he was found in. A man who was found unconscious on train tracks near Northampton has issued an appeal to find stranger who saved his life. John Bryson, 47, from Wishaw, Lanarkshire, was put into an induced coma for three days back in early February after he suffered a mixture of hypothermia, pneumonia and kidney problems. Mr Bryson was visiting the town to meet a friend. 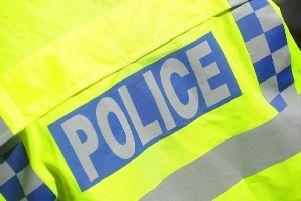 Upon leaving, he ventured away from her house and along a main road north of Northampton where two police officers stopped him and performed a name check. They then took him to Brampton Valley Way so he he could safely use the public footpath walk on. But he fell unconscious on the Northampton to Lamport heritage railway line and was found by a passerby who called emergency services. He said: "Someone in the Northampton area helped me that day and I just don't know how to track him or her down to say thank you. "I believe one or more people called the emergency services and basically saved my life. "I was admitted to Northampton General where I was put into a coma for three days. "There was a whole host of things I was suffering from including hypothermia and pneumonia and my kidneys weren't functioning properly." Mr Bryson was flown to Glasgow Airport via ScotSTAR - a medical retrieval team in Scotland - before he was taken to Wishaw General Hospital. The man was told only four days ago about the incident. He added: "The reason I contacted the Chronicle & Echo is because I didn't find out until last Friday (March 24). "It was upsetting, I was scared, I lost three days of my life." Mr Bryson is hoping the person who found him can fill in the blanks. "I don't know where I was found, it's like filling in a jigsaw puzzle," he added.